A spinal cord injury (SCI) is damage or trauma to the spinal cord that causes loss of movement and feeling below the site of the injury. The spinal cord is about 18-inches long. It extends from the base of the brain along the middle of the back, down to about the waist. The nerves within the spinal cord constitute a pathway that carries messages back and forth from the brain to all parts of the body. This vital pathway is protected by a column of bony rings called vertebrae that surround the spinal cord. When an injury causes the vertebrae to break and press up against the spinal cord, the nerves within can be damaged, and the pathway broken or interrupted. The break or interruption means that the messages that flow between the brain and the spinal cord can no longer get through. The paralysis that results depends on the location and extent of the break. It’s a common misconception that the spinal cord is severed in people with a spinal cord injury. In fact, in most people with SCI, the spinal cord is intact; it is the cellular damage to the nerves that causes paralysis. This damage can occur even without damage to the vertebrae. 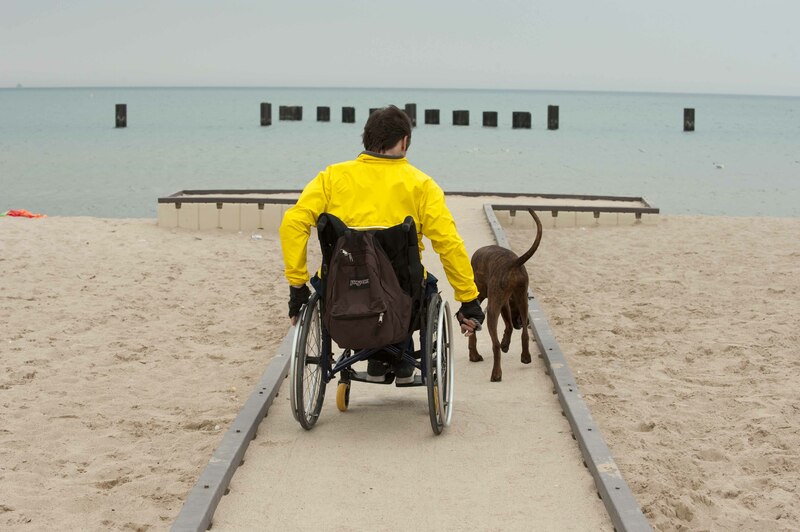 Paraplegia means that paralysis affects all or part of the trunk, legs or pelvic organs. Quadriplegia (or Tetraplegia) means that arms, trunk, legs and pelvic organs are all affected. Cervical injuries above the C-4 level may require a ventilator for the person to breathe. C-5 injuries often result in shoulder and biceps control, but no control at the wrist or hand. C-6 injuries generally yield wrist control, but no hand function. Individuals with C-7 and T-1 injuries can straighten their arms but still may have problems with the hands. The first thoracic vertebrae, T-1, is the vertebrae where the top rib attaches. Injuries in the thoracic region usually affect the chest and legs and result in paraplegia. For T-1 to T-8 injuries, there is most often control of the hands, but lack of abdominal muscle control. Lower T-injuries (T-9-T-12) allow good truck control and good abdominal muscle control. Injuries to the five Lumbar vertebrae (L-1-L-5) and similarly to five Sacral Vertebrae (S-1-S-5) generally result in some loss of functioning in the hips and legs. Lumbar and Sacral injuries yield decreasing control of the hip flexors and legs. The Sacral Vertebrae run from the pelvis to the end of the spinal column. Injuries to the five Lumbar vertebrae (L1-L5) and similarly to the five Sacral Vertebrae (S-1 through S-5) generally result in some loss of functioning in the hips and legs. Lumbar and Sacral injuries yield decreasing control of the hip flexors and legs. A spinal cord injury is called “complete” if all feeling and ability to control movement is lost below the level of the injury, which suggests that no messages are getting through the spinal cord. An injury is called “ incomplete” if there is some motor control and feeling below the injury, which indicates some messages are still getting through. With advances in the acute treatment of spinal cord injuries, incomplete injuries are becoming more common. The most common causes of spinal cord injuries in the U.S. are auto and motorcycle accidents. They account for more than 40 per cent of the estimated 12,000 new cases each year. About 15 per cent are caused by acts of violence involving gunshot and knife wounds. Athletic activities cause about 8 per cent. Use of alcohol is a factor in about 1 out of every 4 spinal cord injuries. More than 80 percent of all spinal cord injuries occur to young males, mostly between the ages of 16 and 30. Thank you for posting up this site! I am a domestic violence survivor, having sustained a spinal cord injury in October of 2008. I wish I would have been allowed the rehabilitation path directly following my injury, instead I was locked in by my abusive (now exhusband) and his family and didn’t receive any ‘real’ help until nearly two years post injury. The road to recovery is not always easy or quick, rather slow and steady, remaining positive as possible along the journey. I’ve learned that living my life the best I possibly can simply involved relearning how to do the basics on my own, this isn’t an obstacle unless I allow it to become one in my mind. I’m glad to see some good informative information about spinal cord injuries posted on your site, there’s power in knowledge! Before I came to this website, I knew very little about Spinal Cord Injuries. But courtesy of Roger Ebert, I got here and after reading this and seeing the Interactive Spinal Cord Injury Map, I have learnt so much about it. This is a beautiful website with quality content and I want to congratulate and thank the people behind it for helping people with the injury and also for bringing awareness about it. Keep up the good work! I sincerely hope people with the injury will find this website useful. wil help, so here it happens. Where is the interactive spinal cord map mentioned in the article?